The key observation is that the owls’ eyes look like crescent moons. This link is most clearly established by the owls that sit on silvery moons. The owl on P4,S19, for example, is looking to the left (to its right) and the whites of its eyes look like a pair of crescent moons in the same shape as the moon it is sitting on. The owl on P10, S27 is looking to the right (to its left) and is sitting on a moon facing the opposite direction. The image explaining what this means is on P2,S16. 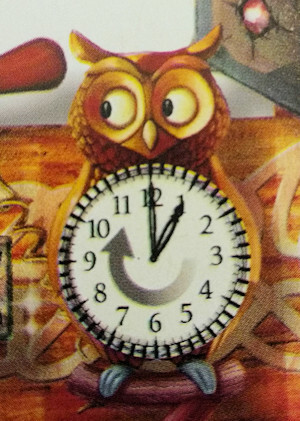 This owl has a clockface on its stomach with an arrow pointing round clockwise. There are 4 divisions between every number on the clock, making 4*12 = 48 divisions in all – the same as the number of squares round the border. The idea is that the moons tell you to move round the border to a new square. The owl with a clockface on P2,S16 is looking to its right which means the right crescent moons, “)”, mean move clockwise. By extension the left crescent moons, “(“, mean move anti-clockwise. There are a huge number of moons scattered throughout the book and some of them are really difficult to spot. Some are in the border squares, some are hidden in the main picture.Fortunately, you can usually tell when you’ve missed one because you end up moving to a new square on the border which doesn’t contain a clearly defined object. So far in this solution I have focused on just the first 12 lines drawn from the first 12 Zodiac squares. Sticking to this, the table below lists the number of moons and their locations on the relevant pages: P2, P4, P6 and P14. I’ve also summed the moons to give the number of squares clockwise (positive) or anticlockwise (negative) that you need to move round the border. A description of the object in that square. This looks correct. Every final square we’ve reached has a single, distinct object in it. It has taken a long time, but we have finally identified the first 12 objects of the solution! Well, sort of… The problem is, these objects make no sense. The objects are supposed to spell out the Alchemist’s spell and the method of casting it. But this sequence of objects is meaningless. Yet again, the conclusion is that something is missing. If you’ve followed the solution this far you won’t be surprised to learn that the missing piece is given to us by the Cuboid puzzle. Before moving on, you can test that you’ve understood the solution so far by finding the remaining 63 solution objects. Don’t worry, the work is not wasted, these really are the final solution objects. Next up is the Cuboid puzzle. This is by far the most convoluted of all the mini-puzzles. It will turn out that, though we have all the right objects, they are not necessarily in the right order.